Visual imagery plays a fundamental role in autobiographical memory, but several aspects of this role remain unclear. We conducted three experiments to explore this relationship. In the first experiment, we examined the relation between the phenomenological properties of autobiographical memory and several measures of visual-imagery ability. 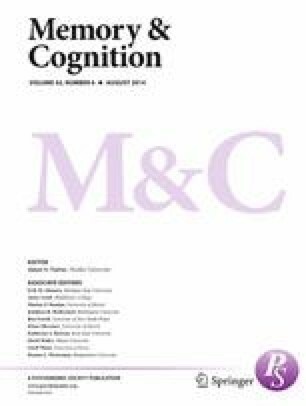 We found no significant positive relation between imagery ability and autobiographical memory, except on a measure of cognitive style. In a second experiment, we examined the autobiographical memories of people with different cognitive styles—namely, visualizers and verbalizers. We found that, for both kinds of participant, visual imagery was correlated with the feeling that they were reliving their memories, but auditory imagery played a greater role in verbalizers. In a third experiment, we examined the memories of individuals who had a congenital absence of visual imagery. We found that they had a deficit of auditory imagery, as well; moreover, they were much less likely than controls to feel as though they were reliving their memories. The results support the idea that visual imagery plays a vital and irreplaceable role in autobiographical recall. This research was supported by a summer research stipend from the College of Charleston to D.L.G. The authors thank Lauren Deasy for assistance with participant testing, and David Rubin for sharing some of the data used in Experiment 1. Each of the questions below appeared in at least one experiment. The specific questions used in a particular experiment are noted in Table 1. For questions a–g, the scales ranged from 1 (not at all), through 3 (vaguely) and 5 (distinctly), to 7 (as clearly as if it were happening right now). As I remember the event, I feel as though I am reliving the original event. As I remember the event, I can hear it in my mind. As I remember the event, I can see it in my mind. As I remember the event, I or other people are talking. As I remember the event, I know its spatial layout. As I remember the event, I can feel now the emotions that I felt then. As I remember the event, I can recall the setting where it occurred. For questions h–n, the scales ranged from 1 (not at all), through 3 (vaguely) and 5 (distinctly), to 7 (as much as any memory). Sometimes people know something happened without being able to remember it. As I think about the event, I can actually remember it rather than just know it happened. As I remember the event, it comes to me in words. As I remember the event, I feel that I travel back to the time when it happened, that I am a subject in it again, rather than an outside observer tied to the present. As I remember the event, it comes to me as a coherent story or episode and not as an isolated fact, observation, or scene. While remembering the event, the emotions I feel are positive. While remembering the event, the emotions I feel are negative. This memory is significant for my life because it imparts an important message for me or represents an anchor, critical juncture, or a turning point. Responses to this last question were recoded to produce two scales. Specific had a value of 1 if the participant judged the memory to take place within a single day and 0 if it took longer. Merged/extended had a value of 0 if the event lasted longer than a day and was extended in a fairly continuous manner over a period of time, and 1 if it was the merging of many discrete events. *Please date the memory (month/day/year) as accurately as you can. Please fill in a month, day, and year even if you must estimate. If the memory extended over a period of time, report the approximate middle of the period.